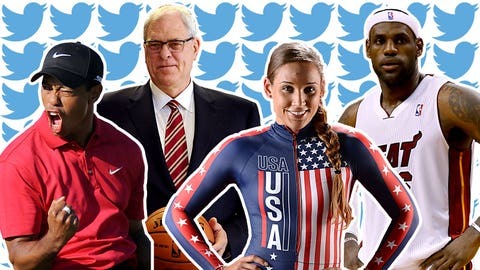 Check out these sports figures' first Tweets. When it debuted on March 21, 2006, who knew that Twitter would become the all-pervasive juggernaut that it is today? In honor of its eighth birthday on March 21, the social media platform has allowed its users to go back and uncover any Twitizen’s first 140-character attempt. And as this rundown shows, some effortlessly jumped right into the Twitter mix. A few were cautious with their approach. Some were downright awkward. i had to set up an account to see who had an account in my name.rungrinch did a great job! thanks! please email me so i know who you are. just had a hard practice, now i am about to chow down on some wings. woke up with Kady, watching Yo Gabba Gabba, trying to get over this strange Fijian flu I picked up so I can skate. nuttin just chillin….new to this twitter thing!!! Going try this twitter thing out. Will be posting about tour life, personal life, etc. Succumbed to the "power" of twtter. Training Camp Update – Day 7. I am now on Twitter. Rule Number 1: Don't Do Stupid S**t Online. Warcraft – out. ITS OFFICIAL…Thanks again @HoopHunnie21 my baby sis for setting up my Twitter page, cause you know I'm going to acted a fool on this ish. Hey everyone! Just got back from Bali! What a trip! Great waves but happy to be home ! Being excited after getting the #1 draft pick in the 2007 NBA Draft.